I found that too often I was preparing assessment feedback lessons just using PowerPoint slides which I read to the students or simply going through exam papers. In an aim to improve the quality of the feedback and to involve students in the process, I have tried the ideas below. I hope that these might act as inspiration for you in a time of assessment changes. My first inspiration came from a resource created by @Laura_oleary and based on @TeacherToolkit. I adapted the exam review created by Laura O’Leary for each end of topic assessment that my GCSE and A Level students complete. The aim is that students follow a series of tasks which focus on their exam paper so that they engage more actively with the feedback. My students do need to be encouraged to not just write “I lost marks for not revising” and as a result their targets to improve are becoming more focused. They are also able to spot trends in their exam papers, for example if they are dropping marks due to misunderstanding command words or a particular style of question. Usually when completing the exam review I hear at least one student gasp a variation of, “but I was only 2 marks off an A” which shows it is motivating them to improve. The exam review sheets have helped my students to focus their revision for future assessments and they are becoming more confident in using them. 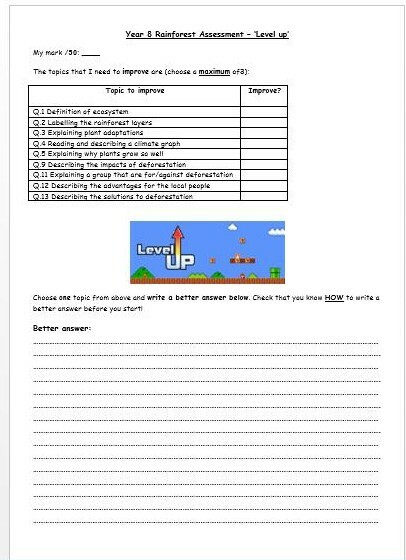 Mrs Humanities (@MrsHumanities) gave me the idea of creating ‘level up sheets’ which students use to improve their work to a higher level and I have developed my own version. Following completion of their exam review sheets I then ask my GCSE or A Level students to choose one particular exam question to improve. Using my written feedback they write an improved piece of work and are allowed to use any work in their exercise books or textbooks. I have found it is an exercise best completed in a lesson so they are able to ask questions and many are keen to know how to improve their extended exam answers. 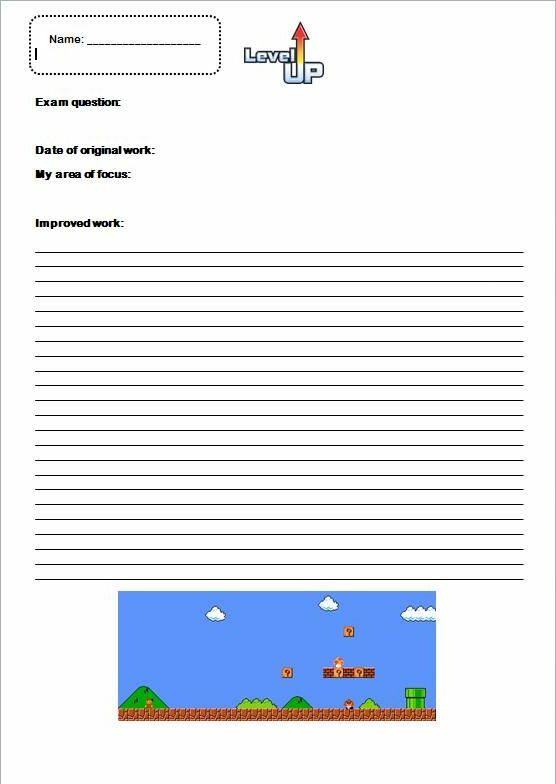 It is also useful to complete the ‘level up sheets’ following verbal feedback so that students are more aware of key areas to improve. Whilst not so beneficial to lower mark GCSE exam questions, I have found these sheets to be helpful when looking at 6/8 mark questions. The process of looking at a question again and rewriting a ‘perfect’ answer is an invaluable experience for exam students. The final way that I have tried to improve assessment feedback is at Key Stage Three. At my current school we are still in transition from levels to a new system, so my feedback has focused on geographical content and skills, rather than how to improve in terms of levels. I have adapted the ‘level up’ sheets, described earlier, to focus on a different type of assessment which has a higher number of lower mark questions based on knowledge and understanding. In the same way as GCSE students, they are asked to choose an area of improvement after looking through their assessments and to write an improved answer. My Year 8 students completed this for homework and there was a noticeable improvement in their description of climate graphs. 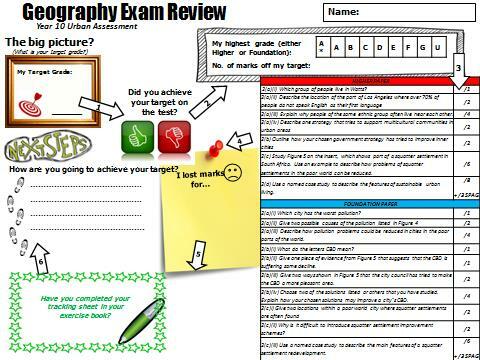 My target is to adapt this sheet for more end of topic assessments so that students are more confident with using them if they choose GCSE geography. The more we can involve the students in the feedback process, the more they will understand what the examiner is looking for and then achieve their potential. These are just a few of the ideas that I have used in my lessons to improve the feedback that I give, and I would love to hear if you have any other techniques that you use. Rachel, thanks for that article I enjoyed it. Are the resources available to use?